Check out our finished piece of handwoven denim. Beautiful blue, naturally dyed indigo yarns, and a luxurious drape that doesn't come from machine-woven denim. While this piece isn't going to necessarily feel like jeans, it sure is gorgeous. After months of running the shuttle back and forth, we've finally finished our five yards of handwoven denim. Take a look at the results as we take the piece off the loom. Making our own string heddles. Beaming the warp threads by pulling them through the reed. Pulling the warp threads through the reed. Our hand dyed indigo yarn being pulled through the reed. Once they are through the read, tie warp threads in bundles to keep them organized and prevent them from slipping through. 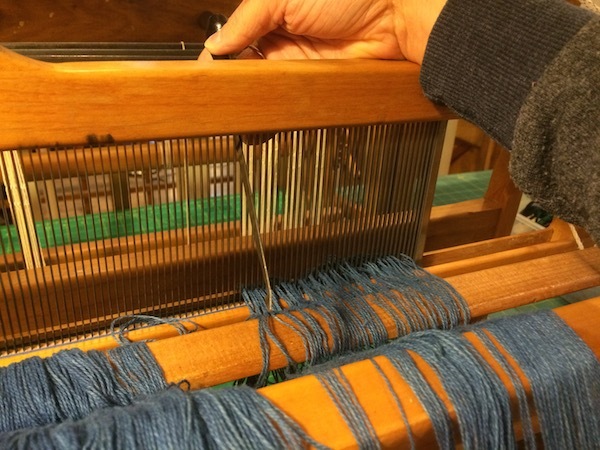 After we are finished threading the reed, we pull the indigo warp yarns through the homemade heddles. Closeup of pulling each yarn through the heddles. Make sure to alternate harnesses. 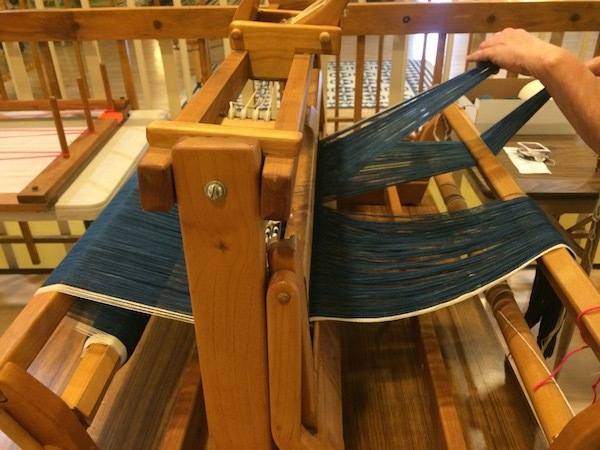 Almost done warping the loom with our indigo yarns! Warp yarns completely tied onto the table loom. Tightening the warp yarns on the loom. With our warp wound and counted out, we could finally put the warp onto the loom, the last step before weaving. But wait, upon counting, we discovered that there were only about 300 heddles on the loom, meaning we were 228 heddles short! So new heddles had to be made and fitted on the harnesses. This was easy enough, with a tying frame quickly put together with a small board and 4 nails placed where the knots in the heddles should be, and some carpet warp tied into loops around it, and then fitted onto the harnesses. 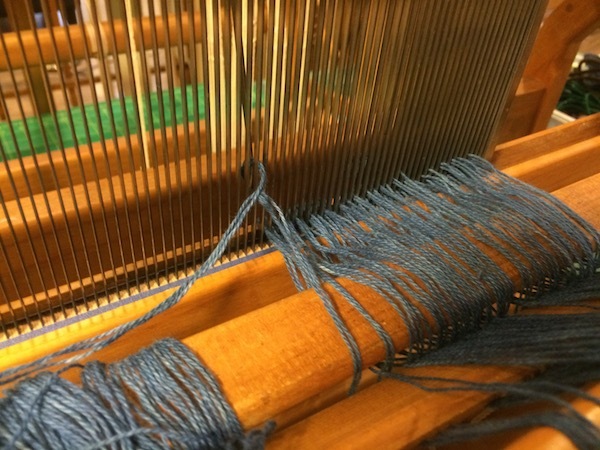 Once the loom was set up, the warp could be threaded through the reed and heddles. This particular table loom has the warp wound on front-to-back, so first we were to sley the reed. This meant placing the wound warp at the front of the loom, with lease sticks inserted into the two sides of the warp cross to keep the cross in place. These sticks were lashed to the loom to prevent them from moving and the beater bar holding the reed pulled forward and secured. Carefully going along the cross from right to left, we used a threading hook to pull three yarns through each dent (opening) on the reed. To prevent any accidental pulling of these yarns, yarns that were already threaded were tied at every ten dents (thirty yarns) with a loose slip knot on the backside of the reed. After the reed was properly sleyed, the beater was released and the loom turned around so the yarns could now be pulled through the heddles. The heddles connect the warp threads with the harnesses that would be lifted or lowered during the weaving process, determining the pattern possibilities. Each heddle held the warp yarn along a vertical axis through an eye and was tied on both ends to rigid horizontal beams that were then connected to pedals or treadles (hand-operated levers at the top). Denim, being a three by one twill, would only use three harnesses, so the fourth was removed and the heddles transferred to the remaining harnesses. Starting from the right side, the little bundles we had tied in slipknots were now untied and one by one, they were again hooked through the eye of each heddle. The heddles were threaded sequentially, one through the first heddle on the first harness, then the first heddle on the second harness, and finally the first heddle on the third harness. Because they were three to a dent on the reed, the order in which these three yarns were selected mattered less than making sure no dent was missed as you went along. Special attention had to be paid to avoid missing a yarn as we went along, since that would result in either the tedious process of starting the heddle threading over again, or cutting the yarn and leaving one dent with less than three yarns, which would create a gap in the weave density. At every six heddles, the yarns were pulled so the ends met at the same length, the threading was double-checked to ensure that the heddles were hanging straight and there were no crossovers, and the ends were tied in a double knot. Once all the heddles were threaded and tied off, the warp was centered and tied onto the back beam. The lease sticks were removed from the front cross and the warp was uncoiled. The beam was then turned so the yarns wrapped around the beam, with warp sticks being inserted through the entire warp at every 1/3 turn to keep even tension and prevent tangles. The warp was wrapped until only about 12 inches remained at the front. To tie the warp onto the front apron rod, the general rule is to hold two bundles of six in each hand (four bundles total) and pull until the tension is even. Then, the bundles in each hand are wrapped over the apron stick, coming up from under and behind the rod and then tied in a tight overhand knot over themselves. This was first done at both ends of the apron rod to keep it taut. Then, starting from the center and working its way outward towards both ends, we pulled and tied the bundles over the apron rod, keeping as consistent tension as possible and making sure that the reed was centered and all yarns were tied on so they ran straight from the back. Once they were all tied, we lightly touched each section with the back of a hand to test the tension, and tightened or loosened any outliers. When the tension was completely even, the overhand knots on the apron rod were tied into square knots and our warp was tied on! Now, with a few cranks of the front beam, the warp was tight from back to front, evenly going through each heddle and reed, and ready for weaving!